With Easter falling in April this year, Charles Wilson-Watkins brings us a little bit of the history of chocolate in Britain. Let’s start at the beginning. It wasn’t until the 16th Century, when Christopher Columbus whilst on his fourth mission to the Americas, seized a canoe laden with cacao beans; he was the first European to have tasted the popular chocolate drink. Columbus took the beans back to Spain, where it became a favourite beverage at the Spanish Royal Court; here it was served with sugar and honey. By 1602, chocolate had made its way from Spain to Austria, and within a hundred years it was popular throughout Europe with the first chocolate house opening in London in 1657. The negative side of the popularity of chocolate was a thriving slave market. Slaves originated from West Africa and the West Indies dating from the early 1600s to the 20th century. Cacao and sugar plantations were established in English, Dutch and French colonies. Swansea has a very dark connection with the slave trade. 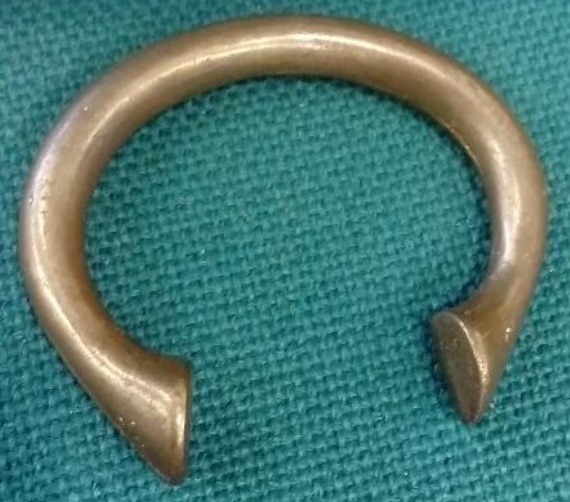 Manillas were made of copper and were used as a form of currency to purchase a number of slaves. They were horse-shoe shaped with engraved finials, with the initials of the plantation’s owner. The copper which was used in the manufacture of the manillas came from Vivian’s Works, situated on the river Tawe. They were shaped and manufactured elsewhere, most likely Birmingham. An example of a manilla (left) can be found in the Swansea Waterfront Museum. The origin of the word manilla dates from the 16th century, from Spanish, based on Latin manicula. Another Swansea connection is that Amy Dillwyn’s great grand-father, William Dillwyn was a member of the Society of the Abolition of the Slave Trade, 1787. Chocolate as we now know it didn’t emerge until the Industrial Revolution, when the Dutch chemist, Coenraad van Houten, during 1828, created a press where half the natural fat from the chocolate liquor was recovered. This innovation, called the “Dutch cocoa”, transformed the chocolate from the liquid form, to solid form, this process was the start the modern era of chocolate, making it cheaper to process. In 1847, English chocolatier Joseph Fry, established his chocolate factory, Fry’s of Bristol. He discovered a process to make chocolate mouldable, with the additional ingredients of cocoa powder, sugar and melted cocoa butter. The first chocolate to be made at Fry’s was Fry’s Chocolate Cream, in 1866 – a product that is still very popular today. 1875, saw the Dutch chocolatier, Daniel Peter, invent milk chocolate, processing it using Nestle’s powered milk with the chocolate. During 1879, Rudolphe Lindt, Swiss chocolatier, developed and invented the conching machine, a process to make chocolate have a superior aroma, and a finer texture. 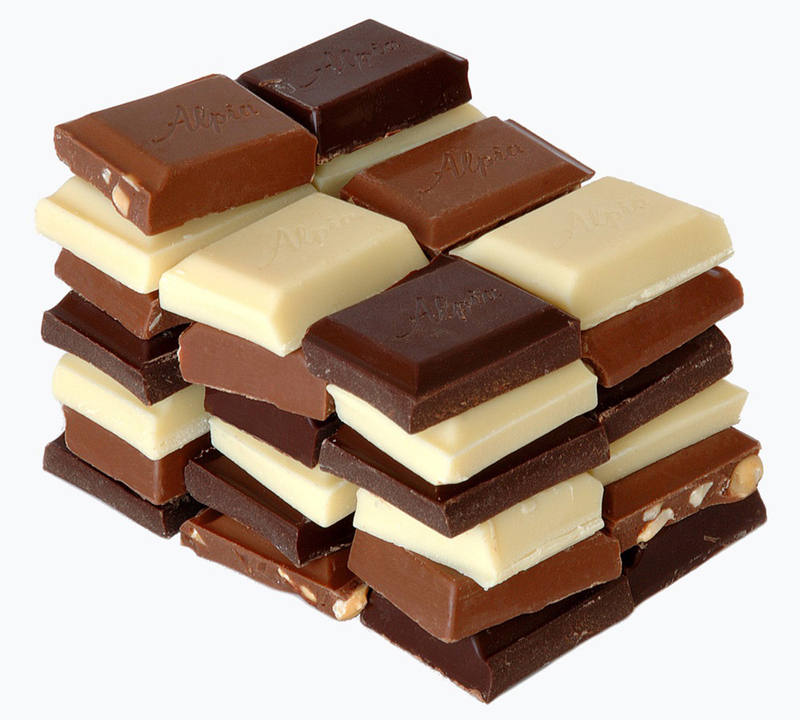 During the later 19th and early 20th centuries, other chocolate companies were established. Rowntree’s of York, 1862, Cadbury, 1868. They were the first to manufacturer boxes of chocolates also in 1875 saw the first Easter egg, hatched. 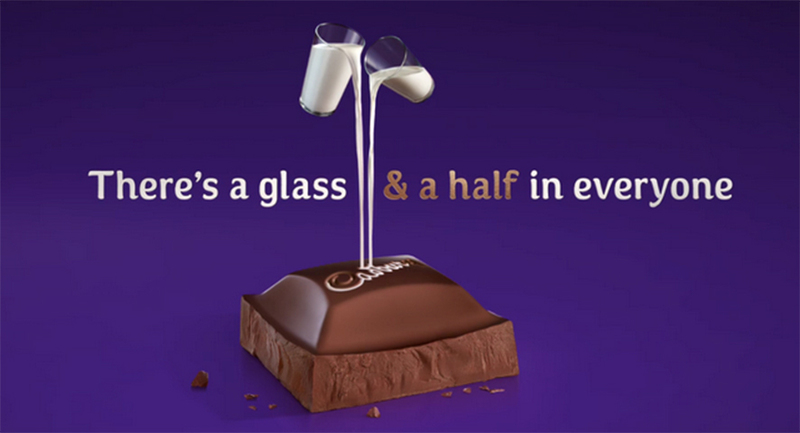 1919 Fry’s merged with Cadbury’s, and 1928 saw the launch of the logo “glass and a half” (modern version pictured left). Before I get to the list of chocolates that are still available today, I am going to write a quick line about sweets, as they are a different entity altogether. The main occupation for a person involved in the sweet trade, was a sugar boiler, who was responsible for mixing, boiling and colouring of boiled sugar sweets. Between the years 1942 to 1953 sweets and chocolates were rationed. During the 16th century, liquorice was used for medical purposes both for humans and horses. The liquorice plant was found growing in Pontefract, Yorkshire. The plant which is indigenous to the Mediterranean and Asia, was brought by Dominican monks, who settled around Pontefract Castle. Even though the plant didn’t flower, it was the roots that were used in the production of liquorice. The Pontefract Cakes, that are available today, were developed during 1760, by George Dunhill, an apothecary and a liquorice grower, who then established Dunhill Confectionary. 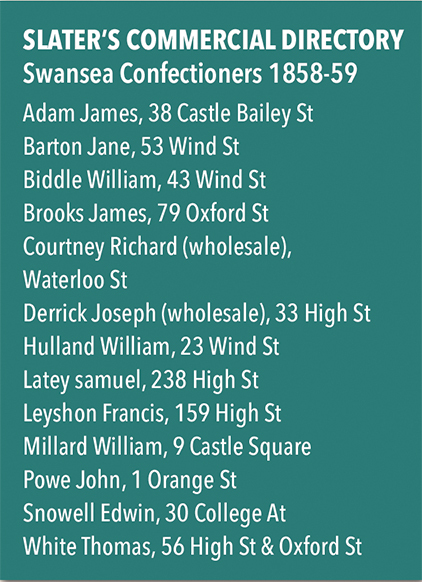 At the time of its publication the Slater’s Commercial Directory, 1858-1859, Swansea is listed as having 13 Confectioners, located around High and Wind Streets. Now for the all-important list of chocolates that have survived the test of time, starting from the earliest. All images show the packaging as we recognise it today. In December 1983 the extra-ordinary eight-hour long film Wagner was released. Written by Charles Wood, and directed by Tony Palmer, the film follows the life and works, of the German composer Richard Wagner, starting before the 1848 German Revolution, through to his exile in Switzerland and to his final triumph at Bayreuth in Germany. The film took seven months to shoot and took place in many locations, including King Ludwig II’s castle in Munich. Other locations included Hungary, Switzerland, Siena, Tuscany, Venice, Vienna and Dublin. The film had a stellar cast with the leading role of Wagner being portrayed by Richard Burton. Born Richard Walter Jenkins, on 10 November 1925, in Pontrhydyfen, Glamorgan, he changed his name in 1948 to Burton, surname of his schoolmaster and tutor, Philip Burton. He is remembered for his powerful presence and mellifluous baritone voice. Burton is also remembered for his numerous marriages, being twice married to Elizabeth Taylor. Burton made 57 films from 1949, The Last Days of Dolwyn to 1984, Nineteen Eighty-Four, released in December, following Burton’s death in August that year, at his home in Geneva, Switzerland. This February/March, the Dylan Thomas Theatre, presented the play Three Knights and Two Welshmen. This profiled an evening at the Austrian Hotel suite, during the shooting of the film Wagner. Burton was in a drunken stupor when he was ‘visited’ by his friend Dylan Thomas, along with Sir John Gielgud, Sir Ralph Rich-ardson and Lord Laurence Olivier. During the course of the even-ing, the friends were trying to out-do each other, and the evening came to an abrupt end when Burton added a final insult to Lord Olivier, and one by one they left Burton in his drunken state. 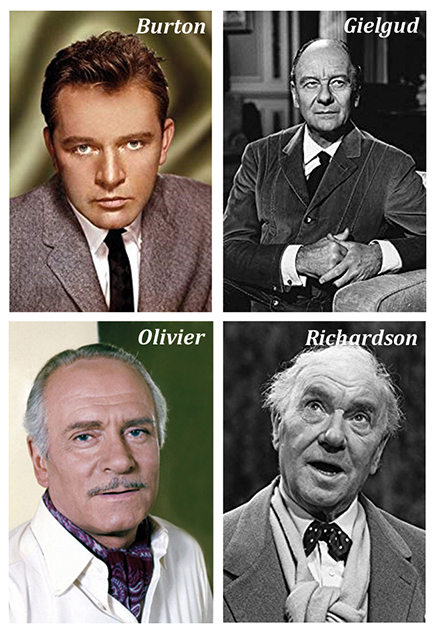 The principal actors were Lyndon Jeremiah – Richard Burton; James Morgan – Dylan Thomas; Stephen Smith – Sir John Gielgud; Dai Rees – Sir Ralph Richardson and Rob Stradling – Lord Laurence Olivier. The evening that I attended, Tony Palmer the director of the film, was in the audience as well as Frazer Hines, of Emmerdale fame. The play had elements of pathos and comedy. 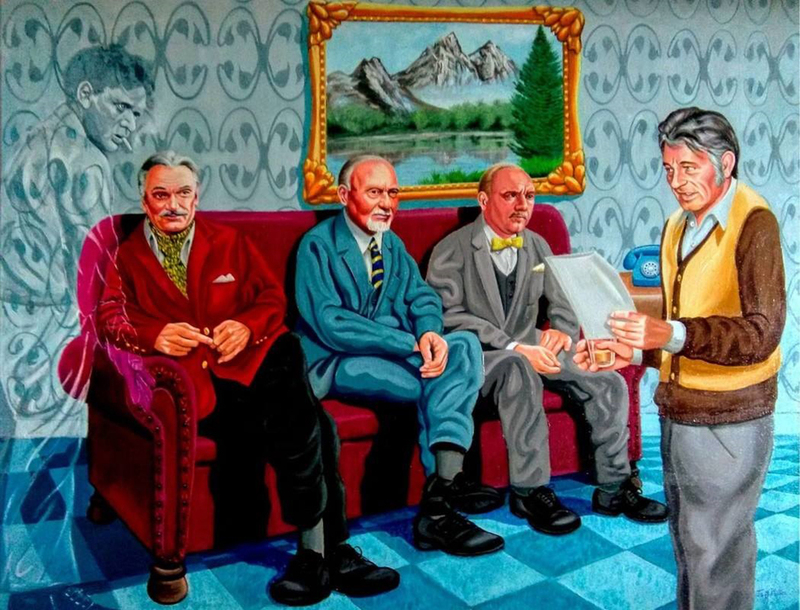 Local artist Jeff Phillips was commissioned to paint a piece (pic above), where he has captured the essence of the five legends.